What happens if you mix an adventure worthy of Indiana Jones with the sass and sarcasm of Hellboy, and then sprinkle it with a heaping helping of holiday magic? You get the surprisingly entertaining dark comedy from Image Comics: Krampus #1 by Brian Joines. 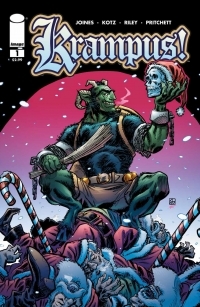 It’s probably tough to pull off a Christmas-themed comic that actually appeals to fans who prefer a gritty story over one covered in sugarplums and dipped in chocolate, and I say this because I recall only one other (The Last Christmas by Brian Posehn and Gerry Duggan) that managed it. Brian Joines, however, has stepped up to the Christmas comic challenge and has emerged victorious thanks to his delightfully wicked “hero” and his own twisted sense of humor.